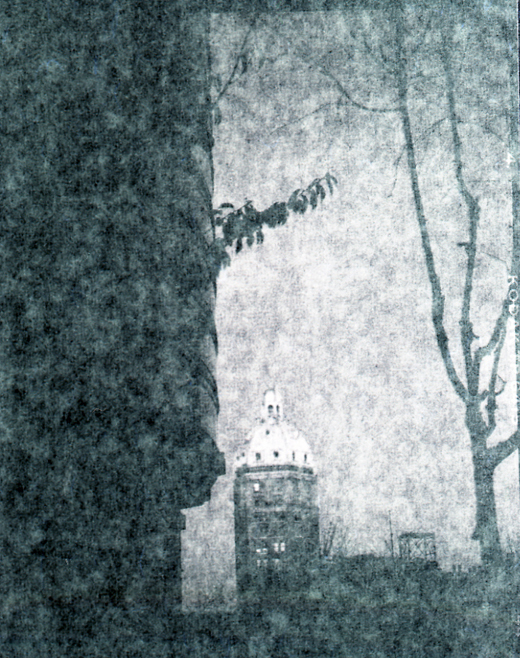 The world's first camera was one that Aristotle observed while resting under a tree. The tree's leaves filtered the noon Greek sun on a summer day. Artistotle noticed a blurry image on the ground. The image was an image caused by the sun going through a little aperture made by leaves that converged forming a tiny opening. If Aristotle had known about lenses and glass he might have tried burning something using the sun. A camera of sorts (and a real chamber it was, and earlier than Aristotle) was Plato's cave. Some slaves with their backs to a cave opening faced a wall. Between the seated, and chained slaves, there was a fire. Light and images coming from above ground were projected by the cave's small entrance on to the wall but the fire made the image even more vague. We know of these deatails since Portuguese Nobel Prize for Literature winner (1988), José Saramago describes the cave, found under a Lisbon shopping mall in his 2000 novel La Caverna (The Cave). Leonardo da Vinci is almost always given credit for inventing the camera obscura which had all the basics of a modern camera except for a some device to permanently record the captured, but ultimately fleeting light image. 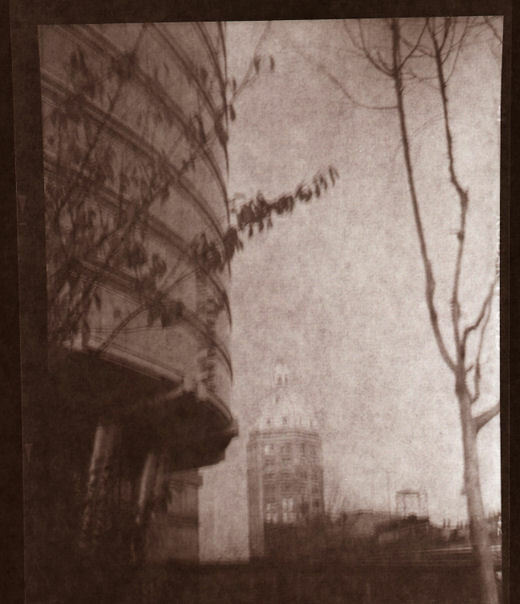 And so it was until Frenchman Joseph Nicéphore Niépce (Chalon on the Seine) used a camera device that made a permanent image of the view of the courtyard outside of his workshop window. It was an 8-hour exposure. While the recording medium has consisted of sensitized paper, sensitized silver plated copper, sensitized tin and sensitized glass it didn't achieve a real breakthrough until 1888 when George Eastman thought of sensitizing a flexible and transparent plastic called celluloid. Nothing changed until the advent of digital cameras with their CCD and CMOS sensors. 1. Lens, sometimes with an attached shutter. 3. A sensitized light capturing material (film) or a digital sensor. Sometimes the shutter is right before the film or sensor. And that pretty well defines a camera, chamber or box. 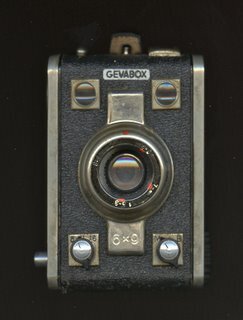 An example of a pretty basic box is my German made Gevabox. It has a glass miniscus lens (quite primitive), three f-stops (8, 11, 16) and a 1/30 shutter speed plus B for bulb (the shutter stays open as long as you press the shutter button). 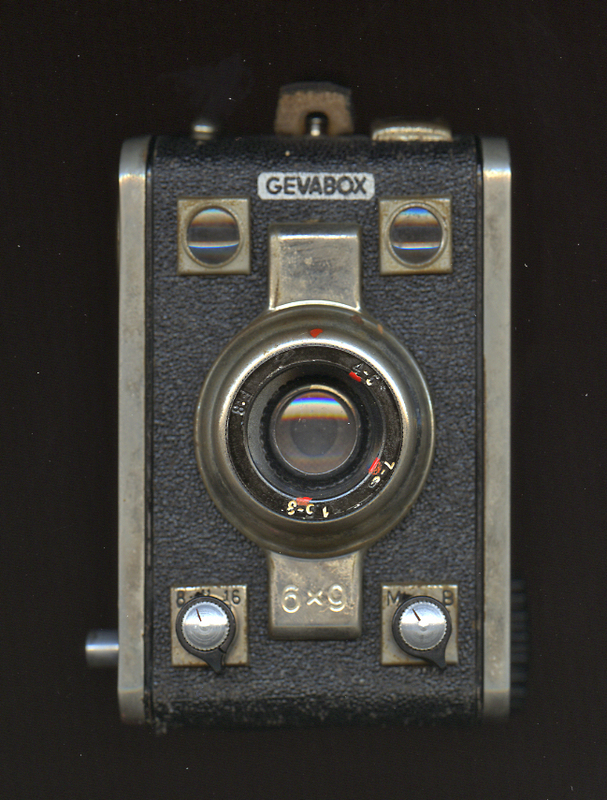 It uses 120 sized roll film and takes 8 6x9 cm images that are not always in sharp focus. The two viewfinders show a distant approximation of what you are going to get. Dr Joseph Ignace Guillotin might have in some way have been an influence as this camera will chop heads with alarming regularity. But sometimes it surprises. Some years ago, two, three or five? I don't remember I must have gone to downtown Vancouver and squeezed a few shots of the old Sun (Vancouver Sun) Tower. 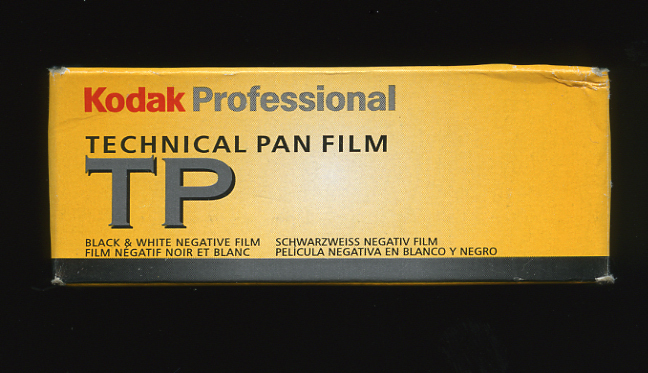 I found the exposed roll of Kodak Technical Pan (ISO 25) in a drawer. I processed it a few days ago. I found two interesting negatives which I placed on my Epson V700 scanner. Before closing the lid (this scanner scans from above and from below, at the same time) I placed a sheet of white letterhead paper on each negative. Here are the results. I sent the pair of photos to my friend Gordon Price (the only Vancouver City Councillor who was never culturally challenged and supported and supports the arts). He ran them in his extremely popular civic, city planning, density planning,etc blog called pricetags here. He nailed for me why he likes them by saying it has all to do with the juxtaposition of the old with the new. A thousand years after the Fall of Civilization, an intrepid explorer with an ancient box camera captures an image of the radioactive remains of downtown Vancouver. Shortly after taking this photo, the explorer was devoured by one of the seemingly ubiquitous mutant armadilloes that migrated North from Texas after the fall. Barely escaping with her life, the explorer's beautiful assistant saves his work for posterity, wearing something slinky and low cut.